La Petite Gourmess: Do You Want Fries With That? French fries just might be the perfect side dish. Crispy and salty on the outside, fluffy and a hint of sweet on the inside. I mean, is there anything better than a burger and fries? (Steak frites, maybe?) And what about all of the different kinds of fries? Shoestring? Steak fries? Curly fries? Hand-cut? Skin on? And fries topped with chili and/or melted, gooey cheese? The favorite in our house: Disco Fries (mozzarella and brown gravy over steak fries). Yum. But, when one is hankering for fries and doesn't have any potatoes in the house, what does one do? 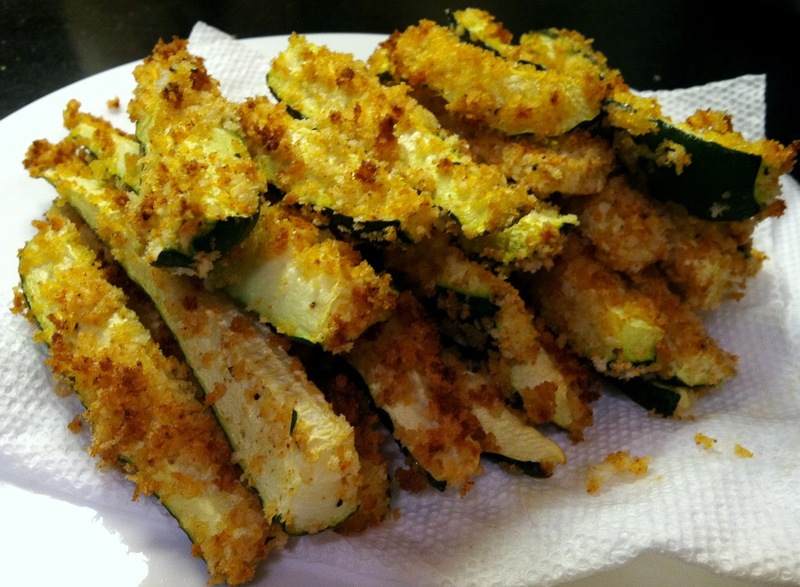 She makes...zucchini fries! 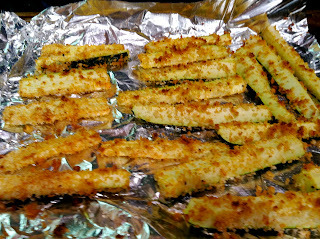 Before you get all upset, please note that in no way am I advocating that you replace the beloved french fried potato with zucchini, but in a pinch, zucchini fries are a delicious, healthy-ish alternative. 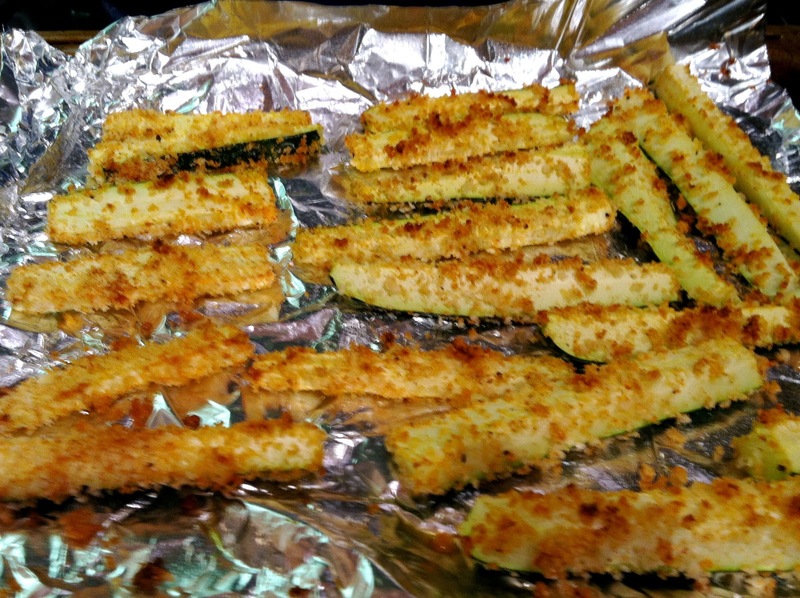 And, zucchini fries are better than no fries, am I right? In all seriousness, these are quite tasty. I added some of my favorite seasonings to the bread crumbs for a bit of zing, and I whisked in a couple tablespoons of seltzer with the eggs for a lighter coating. These are super simple to prepare, and they'll be devoured in less than 5 minutes. Feel free to play with the recipe -- use your favorite spices instead of mine. (Try adding a tablespoon or two of grated Parmesan and a couple teaspoons of Italian Herb mix to the bread crumbs and serve with a side of marinara sauce. Or, use garlic powder and ginger powder with the bread crumbs and add a dash or two of soy sauce to the egg mixture, then serve with hoisin for dipping.) Whatever you choose, I think you'll agree that this is a terrific veggie side dish. Line baking sheet with foil and coat with olive oil spray. Wash/dry zucchini and cut off the ends. 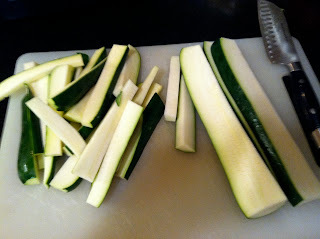 Slice each in half lengthwise, then slice each half lengthwise again into 3-4 equal slices, depending on size of zucchini. Then, cut those slices in half (into long strips about an inch or so wide), and finally, cut those strips into 4-5 inch pieces and set aside. In a large pie plate or other shallow dish, whisk together the eggs and seltzer until foamy. 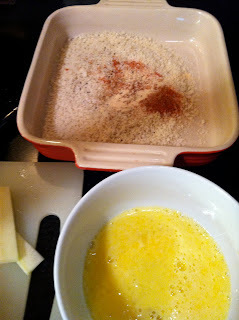 In a similar sized dish, mix together the bread crumbs, garlic powder, cumin, paprika, and a couple pinches of salt. Take each zucchini piece and coat in the egg mixture, letting any excess drip off before coating in the breadcrumb mixture, them place on the foiled baking sheet. 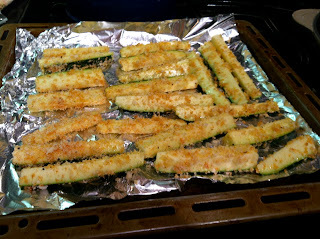 Spray lightly with the olive oil cooking spray then bake for about 20-25 minutes until browned and crunchy on all sides. Sprinkle with a bit more salt and transfer to a serving plate. (Line with paper towels if you want easier clean-up.) Serve with your favorite condiments/dips. Greek yogurt mixed with a pinch of paprika, garlic, and herbs works well.